Weddings can be stressful occasions if you let them become so. What should be enjoyable and full of planning fun can become a nightmare of who will be offended if they are not invited, will Gran like my strapless, non-traditional wedding dress, do my parents regret that I am not having a traditional white wedding, what will my friends think of sitting on hay bales etc etc. Really, just STOP! Your wedding day is about YOU (and your beloved) and no one else. If you tailor it to please others (and you will probably not please everyone no matter what you do) then you will look back on your wedding day in years to come and really regret that it wasn’t how you had envisioned it. Why spend a fortune and loads of time in planning a wedding that deep-down is not what you want? It is your day, your other half’s day and no one else’s. If over-bearing parents step in and tell you what you should do and that you shouldn’t do this that and the other, firmly tell them it is your day and this is what you want to do. 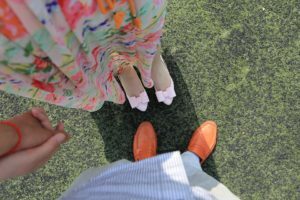 if it is unconventional, then so be it, they will come round – the important thing is the marriage and not the bright red dress you are wearing, or the venue being on a windy beach! And coming onto veganism as another example – relatives will say you have to cater for all sorts of people with all sorts of dietary quirks. But if you are both vegan, why should you have meat at your wedding? People attending your wedding will know of your veganism and may, to some degree, expect only plant-based food. But you really shouldn’t feel pressured to provide meat. 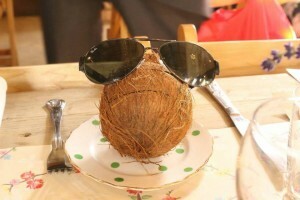 Imagine a hog roast or barbecue on your wedding day when you are vegan? Awful. Also, it is only for ONE MEAL!! Meat eaters aren’t going to perish if they have a meatless meal for once. Use it as an opportunity to provide delicious vegan food and you may even convert a few people to trying veganism too! Keeping with the food theme – don’t feel that you should have expensive caterers at £50 per guest, just because it’s a wedding. Food can be more enjoyable and more fun and tasty if provided by yourself as vats of curry, for example, or chilli, or food where guests can even just help themselves. I know of a wedding which was held in a meadow and all guest bought a large bowl of food and this was the wedding breakfast – great fun as you won’t know what they will bring or what you will be eating! As another example, do you and your other half like a bit of a flutter? 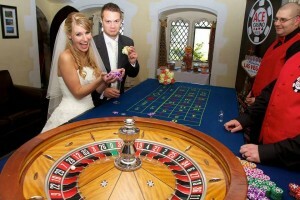 Why not reflect this by having a roulette wheel for guests to have a fun flutter too! Fancy having some unusual entertainment at your wedding? Then do it! 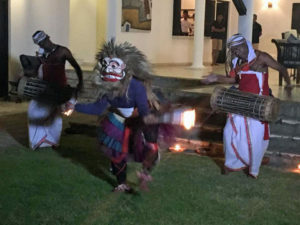 perhaps you had a lovely romantic holiday in Sri Lanka, for example, where your other half proposed to you and want to incorporate some of that into your wedding day by hiring Sr Lankan wedding dancers! Might astonish some of your more elderly, staid guests, but it will be great fun and be a talking point for years after! Do your parents think you should have a huge venue to be able to hold all the many relatives you have? Fine if you can afford it but if you want a small wedding you need to make that clear and that only close family will be invited. After all, why should you fork out thousands of £ to feed relatives you barely now or to provide a party for them! Basically, the bottom line is, it is YOUR DAY, if people sulk because you are not doing it their way then let them get on with it. They either get over it or don’t come to the wedding, up to them!